The peak? Stanley Market? The Buddha and Central skyline viewed across Victoria Harbour? All these attractions are so popular and famous in Hong Kong and are photographed or advertised over millions of times all over the world, but do you know that Hong Kong also has various hidden gems which are not commonly published or included in the tourist guidebooks but definitely some spots should not be missed. Get yourself with a pair of comfortable walking shoes and your camera ready, join us for few hours walk, immerses yourself in an authentic local neighborhood, travel as a real "local" on your own feet, experience one of our impressive public transportation systems - "ding ding" (tram). During our walking tour, our friendly tour guide will point out the interesting sights and share fun facts with you. What do you expect from this walking tour...... we will pay a visit to the "Montane Mansion" or people call it as "Monster Building" - an architecture complex composed of five old mansions which resembles a walled city, it has recently become the loved location for filming like "Transformer IV". 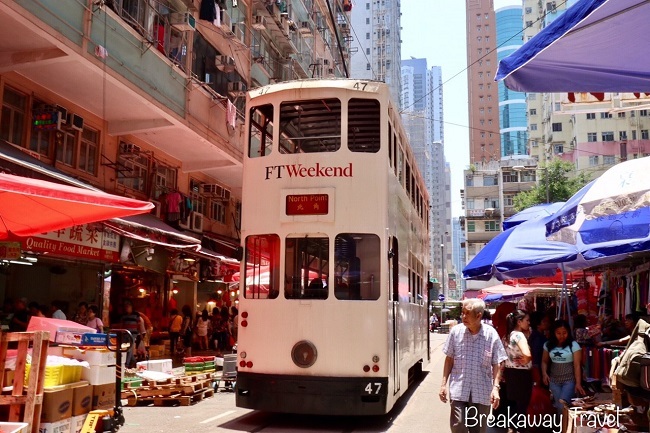 We will go on our journey by taking the tram (ding ding) to the area of North Point, will visit Chun Yeung Street wet market - the market retains a local feel where the locals still shop. You can't imagine that a market on a narrow street can let a tram running through. Drop by a family-run Chinese embroidery slippers store - the last few "hand-made Chinese embroidery slippers" store in Hong Kong which was started their business in 1960. They persist in offering "Made in Hong Kong" products. Follow by the visit to Sunbeam Theatre - one of the remarkable landmark theatres that showcasing the Cantonese opera. We will then ride the "ding ding" again further down to another area of "Causeway Bay" for a taste of living culture - an ancient traditions of "petty person beating" (da siu yan in Cantonese) - a Chinese folk ritual to dispel evil, particularly the kind brought by enemies. After all, let's relax a bit and have a try for one of our most popular Traditional eats - wonton noodles before the tour ends. STARTING TIME : 10:30 a.m.
At 10:30 a.m., our friendly tour guide will meet you at your staying hotel, will take MTR together to Quarry Bay MTR station. Montane Mansion - a fantastic architecture in Quarry Bay consists of 5 connecting buildings which formed an E shaped architecture complex, centered around the courtyard. This giant architecture is a residential complex but the apartment units are small and you can best feel the density of the city when you stand in the courtyard. Each small patio is dotted with wet laundry hanging to dry, lounge chairs for sunning, and flowerpots and a common characteristic of local housing throughout Hong Kong. The facade of the building is rainbow colored, which also make this development more vibrant and lively, made it so popular among photographers for years and is gaining popularity with tourists as well. It has also become a popular filming location for Hollywood blockbusters and the most famous one is "Transformer IV"
Chun Yeung Street wet market - We will take "ding ding" further to the area of North Point, will explore the Chun Yeung Street market - the market retains a local feel where the local still shop nowadays. Local stores are lined on both sides of this narrow street, selling fresh fruits, vegetables, meat and live seafood, what it makes it unique is when the tram running through, people will all stop and wait until the tram is gone through. Sunbeam Theatre - The landmark theatre in North Point has been synonymous with Cantonese opera for the past 4 decades. The theatre is designated specially for Cantonese opera performances, it is divided into a grand auditorium with 1044 seats and a small one with 240 seats as a multi-purpose theatre for stage performances. This is the last private theatre in Hong Kong for stage performances. The atmosphere in the auditorium is so different from the other public performing centres, audience is allowed to pay a surprise visit to their idols at the backstage or dressing rooms which is the special culture of the Sunbeam Theatre. Family-run Chinese embroidery slippers store - will drop by a family-run Chinese embroidery slippers store, one of the oldest hand-made embroidery slipper stores in Hong Kong, is reputed for its Chinese traditional style embroidered slippers and shoes that are suitable for Chinese traditional wedding. "Petty person beating" (da siu yan in Cantonese) under Goose Neck Bridge - will take "ding ding" again further down to a place called "Goose Neck Bridge" in a busiest area of Causeway Bay to share fun and experience by watching how the "beaters" helping the people in need to eliminate their enemies and misfortune by "beating the petty person". "Petty person beating" is a popular cultural ritual practice in Hong Kong who believe that "petty persons" are someone bringing bad luck, troubles or do something harmful to them. When people have no way to express their anger or hatred towards these "petty persons" they will hire the beaters to beat the "human portrait" (represents the petty persons) and do a sequence of steps to prevent them from their harassment and make sure these petty persons can no longer harm them after being beaten. Taste of wonton noodles - After all these walk, it's time to relax our feet a bit, let us take you to a family -run traditional noodle shop to enjoy the wonton noodles and broth. "Wonton" is a Cantonese word for bit size dumpling made stuffed with shrimp and pork, served with noodles and smothered in aromatic chicken broth. During the end of the tour, our tour guide will show you the way to the nearest entrance of Causeway Bay MTR station or alternatively, you are also welcome to stay behind and explore this area on your own.